Joseline then reveals that she has the chance to appear on The Real. The ladies then move on. Jessica tells Joseline about Tommie’s wine tasting. She tells Joseline “You were the subject of a fight. 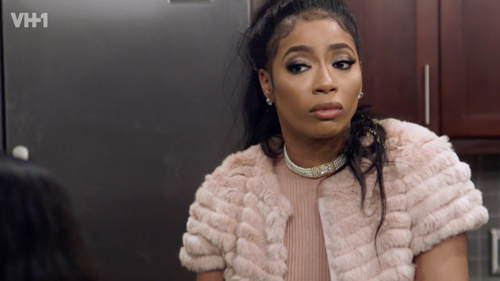 Tommie got mad and came across the table.” Joseline says “I missed alot while I was away giving birth to Bonnie.” Melissa asks Joseline “What about you and Karlie? Can you make up?” Joseline says “I don’t have a problem with Karlie. She just has a big mouth.” Melissa says “Do you think that you can sit down and have a conversation with her?” Joseline says she can. Karlie and Joc meet up to talk about their relationship situation. Karlie tells him “You are the only man who truly gets me and makes me feel our of my element and you hurt me when you did what you did with Tommie.” Joc seems to be moved by Karlie’s words. He tells her “Listen I never smashed Tommie. I figured that she was using me to get back at you.” Karlie is relieved to hear that Joc and Tommie never slept together. She says “I’m having an event for a new store that I’m opening. Will you come?” Joc says yeah. Tommie and Sam show up at KK’s house in an effort to mend fences. It quickly goes south as a screaming match breaks out. Tommie tells KK “I’m upset that you invited my mother to my wine tasting without asking me first.” Sam is upset when she hears this and the conversation goes south from there. Sam tells her daughter “I don’t want a relationship with you.” Tommie responds “I don’t care!” KK steps in and tries to mediate but it is too late. Tommie storms out. KK manages to get Tommie to come back and she is calm enough to sit down and talk. KK says “You want to love your mom.” Tommie says “I do love my mom.” KK tells her “And she loves her daughter.” Just when it seems like they are making progress the conversation breaks down and Tommie storms off again. Tammy, Bambi, Karlie, Mimi and Rasheeda are in the woods having a bonfire, Sierra shows up there as well. Karlie invited her to be there to show her that she is not alone in her struggles. Each woman takes a turn sharing her troubles. When it comes to Karlie she says “I don’t want to go next, I don’t want to go at all.” She then opens up about her man troubles and how it is hard for her to be in a decent relationship. Karlie burns the box that held the fake engagement ring from Lyfe. Then Bambi opens up and buries her relationship with Scrappy. Mimi buries her relationship with Nikko. Rasheeda is next. She decides to burn the diamond heart that Kirk gave her at the I’m sorry party that he threw after the last time he cheated. Tammy is next. She decides to burn all the representations of all of her insecurities. The ladies then decide to plan a girls trip. The ladies are all excited about the idea. Joseline and Melissa are waiting for Karlie to try and make amends. Karlie is nervous about the meeting. Neither woman is really feeling the energy in the room. Joseline says “Karlie you didn’t just get messy you have always been messy. You are the mouth of the south.” Karlie keeps her cool and says “Now that you have had your chance to talk congratulations on the baby.” Joseline thanks her and it is all downhill from there. Both women begin yelling and screaming. Joseline accuses Karlie of sleeping with Stevie. Karlie tells her “The only time I ever spoke about Stevie was to tell you what he was doing. I never slept with him.” Things got so heated Karlie storms out of the room.